As Merla prepares to debrief Sven one of her enemies attacks the supposedly secret base. Merla is seriously wounded, and with Hagar staying to heal her Lotor is forced to trust Sven to reach a potential escape ship. They end up bonding when they are attacked by a local creature. Meanwhile, the Voltron Force continues mowing through Merla’s forces to find where she is and eventually they figure out where that is and head off to hopefully rescue their friend. What they got right: For no inker, the lineart looks pretty good. As much as I want Sven to return to the good side, it was interesting seeing him and Lotor forced to work together. There’s a fun moment when Allura catches Keith without his shirt during practice and Pidge unknowingly breaks her from her swoon. What they got wrong: Nothing to see here. Moving on. 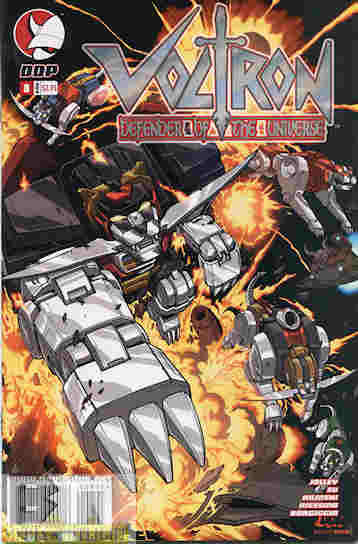 Recommendation: I’m telling you, you really need to pick up this run on Voltron. It’s really good. Posted by ShadowWing Tronix on October 18, 2017 in Animation Spotlight, Television Spotlight, Yesterday's Comics and tagged Lion Voltron, Prince Lotor, Sven, Voltron, Voltron Lion Force. It was strange to see Lotor and Sven bonding. But that’s just one of the many things that makes this Voltron story interesting.